Followers of the Bondi Blog already know about our summer wolf howls, how Nancy was such a howling success with our guests (and with the local wolf pack) during August, September, October and even November. Come December, the wolves just weren't answering. There are reasons for this, that have nothing to do with the quality of Nancy's wolf karaoke skills. Our wolf pack is still here. We frequently see tracks along the ski trails, and from time to time we'll find the evidence of a kill site. Sometimes the resident Bald Eagle leads us to this tell-tale area. It is so rare to see a track that still has a wolf standing in it, however. That said, Sharon, from The Beacon, saw a wolf loping along the snowmobile trail near Marsh's Falls on Saturday! And just because the wolves aren't answering our call doesn't mean you can't hear them. Through the magic of the internet, we're going to introduce you to a great website: The Science Behind Algonquin's Animals. Informative, fun -- and if you follow the link into the wolf research section, you can hear a wolf howl right in your own living room. It's admittedly not the same as standing on the lawn at Bondi, under a summer sky full of stars, with the pack answering from the corner of the bay. But it's the best we can do in January! Labels: wolf howl. The Science behind Algonquin's Animals. Algonquin Provincial Park. Bondi Village. Lake of Bays. This Thursday, February 5th, from 5 till 7 p.m., drop by the Dwight Community Centre for Spaghetti Day! Labels: Dwight Winter Carnival. Nor'Loch Lodge. Dwight Community Centre. The Top of the Hill Gang has been coming to us for winter getaways for several years. Their excuse is that they are cross country skiing, but their true motive is the cameraderie that happens apres ski, when they all get together. Janice organizes heaps of fun activities for them, including an auction -- at which they can only spend "Bondi Bucks". 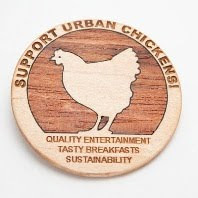 We think this is an inspired idea, and wanted to share the currency with all of you. Labels: Top of the Hill Gang. 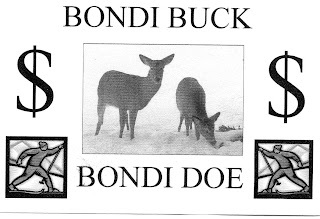 Bondi Bucks. North Muskoka has inspired generations of artists. Probably one of the best known, Tom Thompson, used to stay with friends in Dwight, and their old cottage is still graced with little examples of his art, presented to them as 'hostess gifts'. There are thriving studios all around us, with several Studio Tours taking place throughout the year. The Autumn Studio Tour in September, and the Artists of the Limberlost are probably the best known. But while it's always inspiring and rewarding to visit these studios, there's no need to check out a gallery -- you can try your own hand at Art! Linda, Neva and the girls have been coming for a long weekend at BONDI for 19 years! They move in with their cross country skis, good food, good wine, good friends -- and all their art supplies. This is their 'experimental art' weekend, when they cut loose and try all sorts of different expressions in their artwork. This is the weekend when they 'take a chance' -- sometimes (like all art) it pays off big. And you always learn something! The big fridge in LONGSIDE cottage makes a great place to display art -- as do all fridges! It's a wonderful way to spend a weekend with friends! Labels: Artists Studios. Artists of the Limberlost. Autumn Studio Tour. Girls Getaway Weekends. One of the great things about winter are the Winter Carnivals that take place across the province, from Bon Homme in Quebec, Winterlude in Ottawa, right down to the often more user-friendly versions in the small towns and villages. Huntsville has a carnival. So does the little hamlet of Port Sydney. Dorset has Snowball in February, and Dwight has it's very own DWIGHT WINTER CARNIVAL coming up on February 26 - 28th. While you're there, scoop up a Carnival Button, for $2.00. This is your admission to all the Carnival events! And what events they are! Developing Divas can take part in the Princess Pageant. Bigger kids (that's us adults) can try the hand at the Fishing Derby, log sawing, nail driving and singing in the snow karaoke. Or watch the chainsaw carving contest. Grab a bite of lunch at teh Chili Bar, the BBQ lunch or pick up a pie at the pie baking contest and auction. 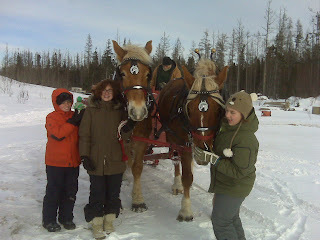 Down at the lake -- and you get there by horse drawn sleigh (how cool is THAT???) the Eichler Racing team is hosting Snowmobile Drags. Ever asked yourself what 0 to 100 LOOKS like? Here's your chance to find out. There's a dance, and just so much more. If you can't have fun here, you can't have fun anywhere. fo complete schedules and information. 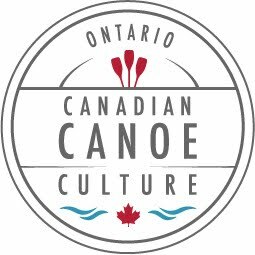 And, did we mention, this event is listed as one of Ontario's WINTERACTIVE sites, so it's good for you, officially! Labels: Dwight Winter Carnival. Winter Carnivals Ontario. Winteractive. Nor'Loch Lodge. Eichler Racing Team. Snowmobile Drags. Sugar Dogs Adventure Co.. family fun. Lake of Bays. Nor'Loch Lodge. 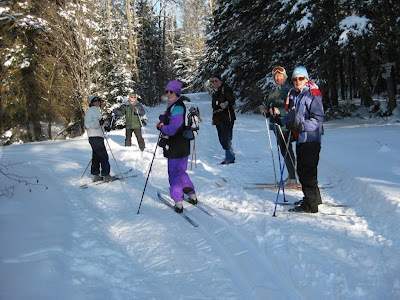 Some of the Ancient Mariners Canoe Club members pause along one of our ski trails to pose for the camera. This section of the trail is not far from the Oxtongue Craft Cabin -- a great place through three seasons of the year to do your Christmas shopping! From here, the trail forks, traveling through the Great Boggy Swamp (our pet name for a portion of trail crossing a black spruce bog -- a wonderful piece of habitat for rabbits, deer, birds... and sometimes wolves. It's full of tracks! It also cuts to the left, climbing up and up to Hawke Lake -- right on top of the hill. And we hope you'll look as happy as this group! Thanks Helen for emailing the picture to me! Labels: Ancient Mariners Canoe Club. Bondi Village Ski Trails. Oxtongue Craft Cabin. Oxtongue River. It's not truly a waterfall -- and one could argue that if the water is frozen solid it is hardly 'falling' in any event. But it looks pretty spectacular, either way. We get a lot of these along the roads up here. There's a monster cliff near Port Sydney where the ice climbers come. And one near Kearney that is coloured pale green by the minerals in the rock. (we are curious if this is the origin of the term 'iceberg lettuce'. This one is located on the Port Cunnington Road. Our "second scenario" of the Ancient Mariners Club were here this week -- they like to describe themselves as the Elite group from AMCC -- and several of them hiked over to check out the ice frozen on the rock cut, about half a mile from Bondi. You can get there along the road, or walking partway through one of the ski trails. Or, as winter moves along, walking right across the frozen bay. However you get there, it's worth the walk, just to check this out! Labels: ice climbing. rock cut. 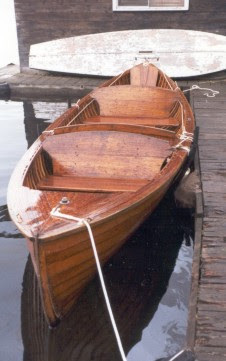 Ancient Mariners Canoe Club. 24 Rinks on the Lake... 156 teams... 3 divisions, with over 400 games being played between 1.15 p.m. Friday and 3 pm. Sunday. 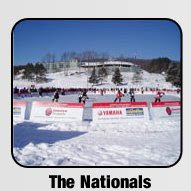 This is the National Pond Hockey Championships, this weekend, at Deerhurst resort, just down the road from Bondi. It's been called "Bar None the BEST Hockey Event on the PLANET" (why not the universe??? do they play pond hockey on the rings of Saturn) What's not to like? Admission is free for all hockey lovers! Labels: National Pond Hockey Championships. The Algonquin Snowmobile Club is holding their annual Chili Cook-off at McCann Camp, January 24 at 11 a.m. The Club has been working hard to get the trails cleared after the big wind storms that hit us around Christmas time. They now have almost all the trails open -- and they have a fabulous new trail goomer. Everyone is welcome at all Club events, and on the trails. Don't forget to bring your manners! We link to the ASC trails, and welcome snowmobilers at Bondi. Labels: Algonquin Snowmobile Clug. Chili Cook-off. There's a lot going on south of the border as our American friends -- and indeed the western World -- anticipate the inauguration of President Barack Obama. Taking on the Presidency is never an easy task, and his is made more difficult with the inherited debt load, and the economic woes of our times. We wish him well, and look forward hopefully to this new regime. It won't be his last. In 2010, we look forward to welcoming President Obama to North Muskoka for the G8 summit. And since our Racing Clams (see posts, July: Chowder Bowl Clam Race/August: Medal Presentation for the Chowder Bowl/ and November: The clams Know to read details) predicted that Mr. Obama would win the Presdential election, perhaps we should be arranging for a special running of the clams while the G8 is in town! Labels: Obama. Inauguration. G8 summit. Didn't bring the skates? Not a problem. We've got huge parking lots... and the Baillie family simply took one over for Ball Hockey, right outside the main Lodge. There were too many of them to count, actually, with the ball whizzing about. Spencer (9) and Nathan (4) were hard at work in the goalposts -- which had been lovingly marked with plastic drinking glasses! Three generations, at least, were out there working the sticks and chasing the ball (bright green, it never needed the American network trick of tracing the puck with a weird blue light on television). Too much fun! There was the occasional call from the doorway that it was 'just ten minutes until lunch', but nobody seemed to be paying much attention to that! There were goals to be scored!! -- but NOT if Nathan and Spencer had any say in the matter! Labels: ball hockey. street hockey. For Christmas Nancy and Bill give their family the gift of a weekend at Bondi Village. They've been doing this since 1983. Our winter season would simply not be complete without their arrival! It is, Nancy says, "the best thing we can do for them." Everybody steps out of their routines, away from the technological gadgets and the hectic pace of their lives, and they all get together to reconnect. What with kids, and grandkids, the gang keeps getting bigger every year, and the fun never seems to slow down! 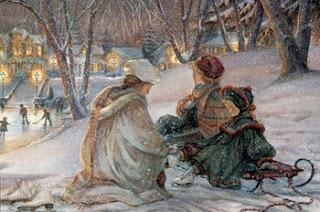 One of their traditions is to hit the toboggan hill. When they all go trooping off, it is a bright line of colour advancing across the snow. Before heading out, Nancy took a moment to chat with Holly -- she's known our poodle since Holly arrived as a little puppy! Labels: family traditions. tobogganning. Bondi Village Resort. I was at the Dwight Garden Centre this week -- picking up birdseed, not garden seed just yet! Although the seed catalogues are here, and Carol has been poring over them planning for the summer season! Linda always has an interesting collection of items for cottage and garden at her store, and this season is no exception. Out on the porch, amidst some really unusual and attractive birdfeeders, there was a freestanding 'lampstand' that had a clock on one side and thermometer on the other. It was really attractive -- but on closer inspection, we think it's meant for a more southerly climate. While it goes up to 120 degrees, it will only go DOWN to minus 10. Mind, that would make us all feel better about the weather, I'm sure! And if you were buying it for the summer cottage, it would be a really handsome acquisition. Not that I truly have a need for a thermometer anymore. Not since Achmed arrived. That cat, I swear, has a little drip of mercury at the end of one whisker. He comes to the door, tilts his head sideways and carefully extends one whisker outside. There is a short pause while things register and the results get sent to his brain. If the temperature is below his acceptable cut-off point, there is a single shake of one paw, and he zips back into the house, and his 'cat tower' next to the fireplace. (into which he stuffs himself, paws, tail and nose protruding...) We could all learn from this! If the weather meets with his approval, he goes out for a little trek up to the barn to go mousing, or over to the office to see if he can sweet talk Carol into letting him inside for an exploration. To appreciate sunsets, all you really need is an unobstructed westerly view. Luckily, we've got just that, since we face Southwest all along our 2000' of shoreline. The thing about sunsets is that they are never the same twice. We get hot reds, and golden sunsets. Pinks and blues, and everything in between. And sometimes, like this one when the mercury was quivering down there around 25 below, we get lavenders and blues. Cool colours. So it's perhaps no surprise that this little deer came happily to the picnic table to nibble on a small snack of bananas and raisins and apples with the Ancient Mariners Club. They were inside, warm and cosy by the fire with their own hors d'ouevres -- outside, equally warm in her thick winter coat, the deer was very happy to join them for Happy Hour! Labels: Ancient Mariners. Noel. Readers Digest. Doug and Barry were here with some of the Ancient Mariners' Canoe and Outing Club from Waterloo. None of them let the chilly temperatures keep them from having a blast in the great outdoors! 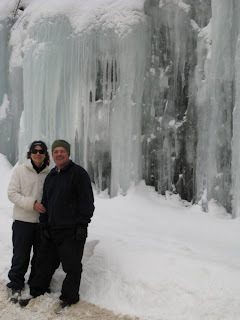 They were out hiking, snowshoeing, and of course, cross country skiing. Indoors, they gathered in our big unit, called the LODGE, for fun and fellowship next to the fireplace. I caught up with Barry and Doug just as they returned from skiing one of our loops, both of them 'well decorated' with frost! It's very true -- weather always looks worse through a window. You have to get out there... and when it's cold, keep moving! Labels: Ancient Mariners. Bondi Village. Trisha Romance Fans Take Note! If you are a fan of Trisha Romance's work (and honestly, how could you NOT be????) then you have a golden opportunity opening before you. JANUARY 17TH, from 11 - 1 p.m, and then after a quick lunch, from 2 til 4 p.m. This is your chance to meet and chat with one of Canada’s favourite and renowned artists. Trisha will be signing and personalizing items, as well as promoting the release of her first ever “Children’s X-mas Story Book”. Her Collector Plates, Limited Edition prints and canvases, books and ornaments are all avaiable at this venue. 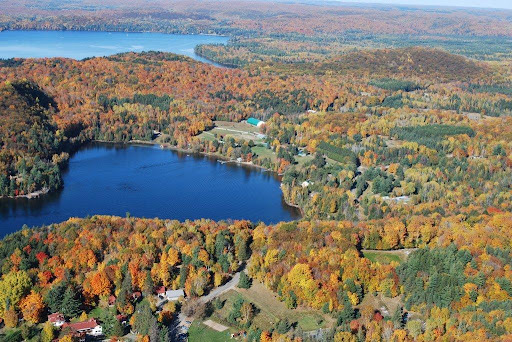 If you are in the area, or if you are perhaps coming up for the Lake of Bays Association Annual General Meeting to be held in Dwight on that same Saturday, you might want to take a swing past Grandview and check this out. Drop into the Owl's Nest at Grandview for a quick snack, and your day is complete! And honestly, what day is complete that doesn't have a little Romance in it??? Labels: Trisha Romance. Delta Grandview. The Owls Nest Pub. Lake of Bays Association AGM. If you know what a Dispro is, you are already humming that tune. If you don't, here's your chance to learn. 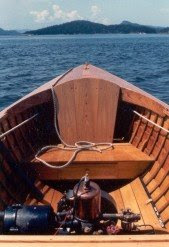 In 1914, in Port Sandfield, a new type of boat slipped gracefully into the waters of the Muskoka lakes. With lots of logs, deadheads and snags, not to mention rocks, navigation on the lakes back then could be a little challenging. A log lurking just beneath the surface would rip up your propeller, and you'd be converted swiftly from a putt-putt motor boat to a rowboat. The Dispro changed that. More officially known as the Disappearing Propeller Boat, a unique design that allowed the propeller to safely move up into a housing in the boat made these the boats of choice. This September, the Disro Owners Association will be at Hidden Valley for their annual Convention. We'd like to invite them to extend their stay -- For any stay with us between September 9 and Septebmer 17, if you bring your Dippy with you, we'll give you 50% off our regular rates, and somewhere to launch and dock the boat. Come Take a Trip, in my Dippy Dip Dip! Labels: Disappearing Propeller Boat. Dispro Convention. Hidden Valley. Dippy. The lake is stiff... as Thumper told Bambi... The Algonquin Snowmobile Club, after heroic efforts to get all the windfall trees cleared off, has now opened the snowmobile trails. They are groomed, and look awesome. The sleds are back -- and our neighbouring resort, DEERHURST, is offering a special deal for all the sled-heads out there. If you drop into Deerhurst along the snowmobile trail, and fill up your snowmobile with 10 litres of gas or more, you can join them in Pavilion PUB for a FREE BOWL OF HOT CHILI. It's a deal! Deerhurst is a 5 Star resort, and host to the 2010 G8 Summit. Here your chance to drop by and have a look, with a free lunch in the bargain! And keep it straight -- you BUY gas, and GET chili... not the other way around! When you've got an itch, you just have to stop and have a little scratch. This deer paused while browsing along the shoreline in front of my house to do a little fur coat maintenance. In winter, the deer grow the most marvellous coats. Their sleek short summer coats give way to a double layer, with thick outer hairs that have a hollow shaft. These provide such excellent insulation that the snow won't melt on their coats: they stay nice and cosy underneath their own portable fur rugs. The second picture shows that icing of snow -- and also shows you how high some of our snowbanks are this winter! Great for the kids to slide down! The deer come right up to Nancy's house, cleaning up any sunflower seeds that the birds have knocked down from the feeders -- and looking hopefully for a treat of an apple or a carrot as she goes to and from the stables. Labels: whitetail deer. Bondi Village. winter wildlife. That's certainly the case, where two days back it was dipping down to 25 below Celsius. Then came a night with an enormous ring around the full moon -- a moon-do-- signifying a change coming in the weather. Today it is just 5 below, with some soft snow falling, perfect for outdoor activities! That cold snap got Jack Frost out and active, however, up at the stable. The horses' breath provides the moisture in the air that Jack needs to get a really good piece of artwork on the go, and the Pony's stall has just a single pane of glass, so it is an excellent canvas. Was Jack the muse for the invention of the paisley pattern, we wonder? For years, Mary Anne has been the Fan Club, standing on the dock in summer (armed with sticky buns and hot chocolate on the cooler mornings) waiting for the intrepid participants in the weekly Marathon Swim to return dockside. Her friend Shelley has been logging endless 'virtual miles' in the lake, while swimming down 'virtual rivers' to keep her exercise program motivated (you can read about that in the July 25th, 2008 post, Marathon Swim). But finally, Mary Anne is 'one up' on Shelley, and all the rest of her summer crowd, because this winter she walked on the water. Out over the ice. Not just to the Point, but along the shore level with the Island. And back. That's a long hike! 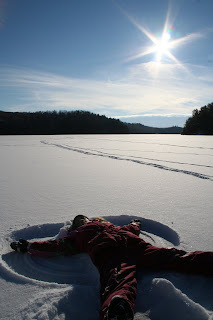 Sydney was staying in the next cottage over, and while she didn't walk to the Point, she did hike up the mountain, and she made snow angels, and produced one of the loveliest photos we've ever seen! You can just see the point beyond Sydney. Labels: exercise programs. Winter activities. Bondi Village Resort. Lake of Bays. That's Mike Slattery. And beside him, beautifully positioned on the cottage deck at Lantern cottage, is Mike's tent. Mike is currently working with the U.N. in Kenya as an intern, and was home for Christmas. While back in Canada, he snapped up a tent to take on his African adventure. He is, after all, planning a campaign that involves Mount Kenya, among other places where it can get chilly at night even near the equator, and where you want something a little stronger than a beach towel to keep the lions at bay. Which meant that prudently he had to test this new tent. It was advertised as an "all season" tent, and we're pretty sure that we get more extreme seasons here than he's likely to get there, if you get our drift. The tent got the drift -- Mike put it up just before we got smacked by a good Canadian blizzard. We don't think it has a snowflakes' chance of seeing weather like this in Africa, so we reckon Mike's good to go! Not all birds are snowbirds -- although we currently have a flock of those here, swirling about. We mean the kind that fly south every year to avoid the winter. A lot of our birds stay year round. Chickadees, for example, brave little puffs of feather that venture out in the coldest weather. In the winter, the bird feeders are busy places, with old friends, like the huge noisy flock of bluejays that are currently here emptying out the sunflowers almost faster than you can pour them in. And woodpeckers. Like this little downy woodpecker. Along with his bigger relative, the hairy woodpecker. And the pileated who never bothers with the bird feeder while he can be tearing up a tree for bugs. Sometimes, we get birds that should go south, but don't. Like the mourning doves that seem to be wintering over. They do that sometimes -- but seldom enough that Nancy always has a notation in her diary in spring when the mourning doves reappear. This winter, we've got about five of them, coming in for seeds. And there are more seasonal birds, those we'd never see around in the summer, like this striking Pine Grosbeak. Brian Slattery, along with Quinn, and several of our other guests, spotted a Bald Eagle circling out over the lake. These birds are very rare here. The staff in Algonquin Park were excited last summer when they discovered about 3 nests, indicating that there was breeding activity, because the Bald Eagles haven't been seen here in close to a century. They are spectacular, and surprising enough that if you see one, it's not hard to be so engrossed watching the bird that you take a small detour into a ditch... talk to Nancy about THAT little adventure! Labels: bird watching. bald eagle. pine grosbeak. algonquin provincial park. lake of bays. Still, they are enterprising little birds. This one found a hanging basket full of dirt, en route to the garden shed, with a lovely little sunbeam finding its way right there. She did the best she could to fit into the basket, and while she was at it, added to her entertainment repertoire by creating 'shadow chickens' on the wall behind her. The Bobs are still laying about 18 eggs a day for us, with a little encouragement from a heat lamp in their new coop and a light left on in the stable in the evening to extend their daylight hours. That's Daniel, with his Dad, on the rink, thinking about learning how to slide. That's Daniel's snow fort. We couldn't take a picture when he was in it, because it wasn't safe to be that close, with the snowballs just flying. And that's Daniel's favourite decoration, the rocking polar bear and penguin. He insisted on going to see this every single day. We're delighted that he liked this. Nancy received an award for the 'tackiest decorations' in her garage, and this was part of the ensemble (along with the light up pink flamingo... gag) Martha Stewart most definitely doesn't live here, but this decoration just had to put a smile on your face! That's Mike, part way up the tubing run for 'just one more, Mom' trip back down. Way down at the bottom of the hill, you can just spot Ray, with baby Jamie on the toboggan. They'd spent the afternoon on the toboggan hill, with magic carpets and a Christmas gift snowboard, but on the way home, the lure of the tubing hill was just too much to overcome! Not everybody was on the rink. Lots of folks were out on snowshoes! We have trails enough for all levels of ability and energy. Wandering up through the back fields, checking out the wildlife tracks and the gently rolling Hawk Lake trail through the black spruce bog, or making your own tracks far away from any trail, all have appeal. Quinn tracked the wolves, and found where they'd spent the night, and everyone was reporting seeing fox and rabbit, deer and squirrel tracks by the score. Evan enjoyed having Mom do all the work while he was all cozy bundled up on her back. We're told that Brad did take turns spelling Kath off in the Carrying Evan department! Labels: Bondi Village. Scenic Lookout. Snowshoeing. All the Work on the Rink Pays Off! Where to start? 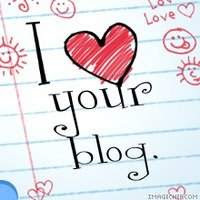 My computer died, just before the hydro went out, and between that and the holidays, I have been dis-connected, and have fallen behind in the Blog! Horrors! It was poor timing, because there was so much happening here at Bondi Resort over the holiday season. We had a full house, and great winter conditions! We had rain in the days before everyone arrived -- that actually helped with the Skating Rink! When the weather got cold again, Brian was able to flood the rink, to produce a fabulous surface. It got a great workout, from young -- like Esmee, pretty in pink -- to young at heart - that would be Stan, showing fine form in goal! We were never able to get a good head count -- there were just too many people moving too quickly out there! Reliable sources informed us, however, that there were at least 20 skaters involved in the fun and games! Labels: Bondi Village Resort. Outdoor skating rink. The expression "Mush" comes from the French verb, "marchez", a word hollered by the dog sled drivers in the ever so brief moment before the dogs began to run. Huskies love to run. If you ever have the chance to attend a dog sled race, you'll notice that the dogs are jumping and barking frantically at the start line, and at the dog lines. But as soon as they come off that starting line, the dogs run silent. There are several companies near Bondi that offer the experience of dog-sledding. You can go out for a few hours, half a day, a full day, or even overnight with some of them! It's a fantastic winter experience. 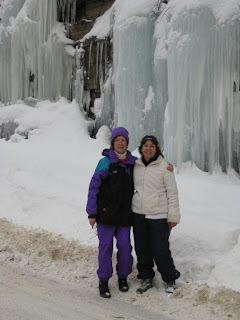 While they were staying with us at Bondi this Christmas, Wendy -- in charge of the team -- and daughter Rebecca, enjoyed a day out with Winterdance dogs, cruising through the beautiful winter landscapes near the Haliburton Forest Reserve. Labels: Winterdance Dog Sleds. Bondi Village Resort. Muskoka winter activities. 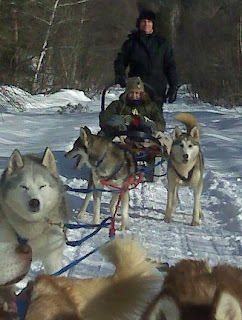 Dog sledding in Ontario. A Two Horse Open Sleigh! Geoff, Wendy and the kids are more used to seeing Bondi in Summer Greens, splashing in the Blue Lake, but for the past few years they've been coming up in the winter, too. Not that we see much of them while they're here, because they are always on the go! Here they are enjoying the big team of Belgians at the Little East River Farm, not far from Bondi, for a fun sleigh ride, lots of hot chocolate, and sleigh runners and horse harness squeaking in the cold air! Labels: Little East River Farm. Sleigh Rides. Bondi Village Resort. Winter Activities in Ontario.